Educational Viewing Platform constructed along Bass Lake Creek. A few minor items occurred on the project. The initial excavation of the rock pool was carried out by the contractor without the supervision of GLES. This resulted in the pool depth being slightly shallower than intended (i.e. the pool depth was measured by the contractor down from the existing water level rather than down from the existing rock surface as intended by the design). In addition, post construction inspections revealed that there was a lack of spawning gravel on the site. The contractor immediately corrected this deficiency when informed by GLES. The Little Current Fish and Game Club partnered with Manitoulin Streams to accomplish a common goal of completing the final rehabilitation stages on the upper portion of Bass Creek. Spawning beds were enhanced through the strategic placement of suitable sized (10 – 30 cm) rock from 1997 till 1999 in the lower reaches to accommodate the rehabilitation of a local walleye population. A fish ladder was installed in 2006-2007 to allow for migration of salmonids to more suitable spawning locations in the upper reaches of the creek. 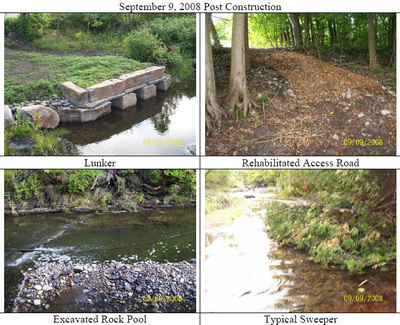 One of the final phases of improving fish habitat features occurred in 2008. This “high public visibility” project is located next to a highly used public park area and access is ensured by the municipal road–right-of-way allowance that borders both sides of this creek. Rehabilitation work will benefit the productivity of rainbow trout, various salmon species and walleye which return to Bass Creek each year to spawn. A viewing platform was installed for public use in the fall of 2007 and educational signage was installed in 2008 to explain and create awareness about biological processes and rehabilitative efforts. 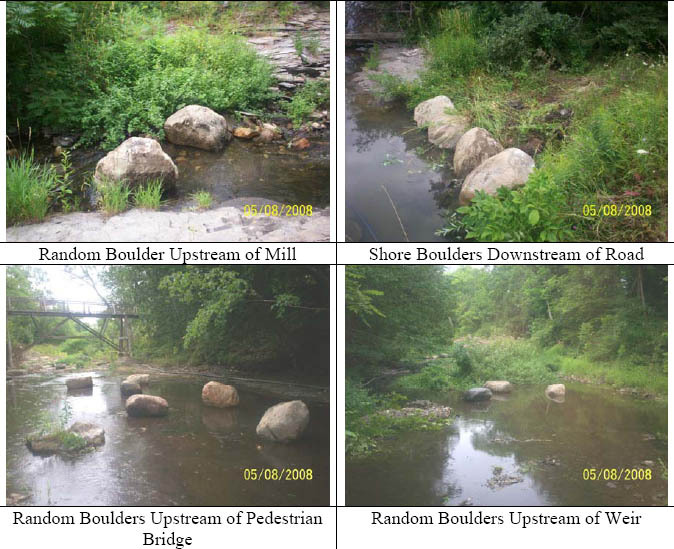 It also recognizes CFWIP contributions toward this stream rehabilitation project. This project will demonstrate the valued benefits of this community stewardship initiative to the public and local landowners. This project’s objective included improving the aquatic habitat substrate through the extensive addition of spawning sized gravel and larger rock boulders; creating holding pools for spawning salmonids, and rehabilitating the channels shorelines by establishing a new shoreline that can withstand the force of peak flood flow conditions while providing fish habitat along its edges. 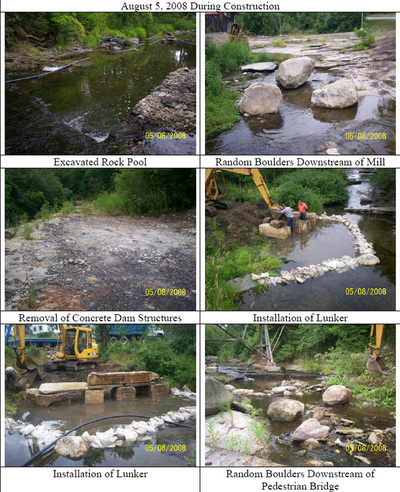 The rehabilitation of Bass Lake Creek involved the excavation of (1) holding pool with spawning substrate, (3) sweepers, placement of rip rap at an existing weir, (2) 1m diameter strategically placed boulders, 1 limestone LUNKER, 1m diameter boulders downstream of existing finger dams at 3 locations, demolition of a concrete dam structure, placement of spawning gravel at various locations. The fish habitat features have dramatically improved the aquatic and riparian habitats of this site. 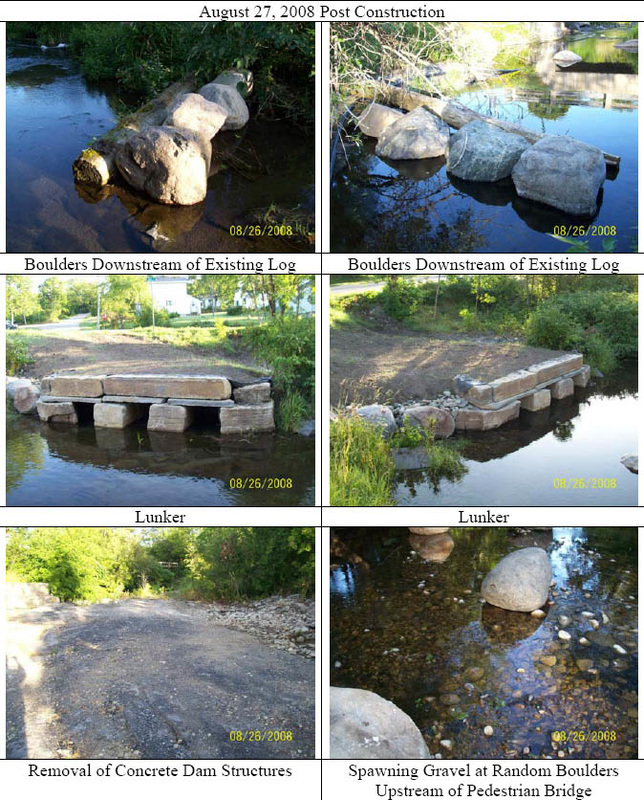 The work was completed according to the site plans through the cooperation of landowners, dedication of volunteers, consulting expertise of Great Lakes Environmental Services (GLES) and equipment, material, and services of Ferguson Construction & Aggregate Ltd. Funds from various sources were used to complete this project. COA contributed for Site Design in 2007. Heavy equipment rental and material costs were paid by CFWIP, Little Current Fish and Game Club, Township o fNEMI, COA, NOHFC and COA also contributed for Site Supervision by a certified engineer. This project had 96 volunteers working on this project at various times. Manitoulin Streams had numerous meetings and email communications to discuss the details about this project including sending out Site Design Request for Proposals, Tenders and Site Supervision to ensure proper delivery of site design and issuing a winner of the bids. A total of 193 volunteered hours was dedicated by 61 “Manitoulin Streams” committee members attending meetings to discuss planning procedures. An additional 40 volunteer hours were accumulated by the 5 Stewardship Rangers who cleaned up the area, brushed, cleaned out pools etc. Little Current Fish & Game Club had 30 volunteers dedicating 188 hours toward raising funds with their Wild Game Dinner, meetings etc. They contributed toward the Bass lake Creek Project.